1) Use the calendar views area to toggle between different event display layouts. 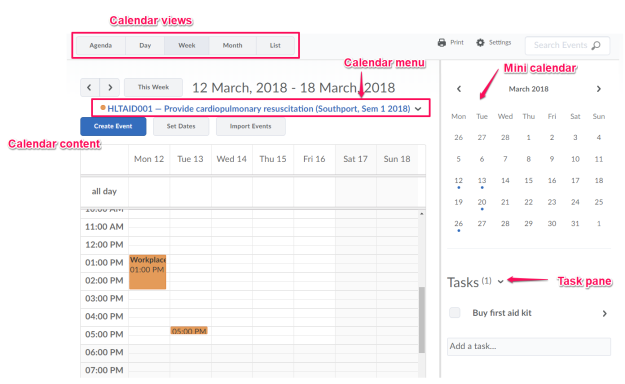 Use the Agenda view to group your unit events by Date, Unit, or Category - events display in chronological order, and all-day events display at the top of each grouped listing. Use the Day, Week, and Month views to group your events in daily, weekly, or monthly increments. Use the List view to filter your events by Assignments, Checklists, Discussions, Grades, Materials, Modules, Quizzes, and Surveys. Click Calendar > Create Event. To associate unit content with the event, click Add Content. Select the module from which you want to add content. Click Add. If you've associated unit content with the event and want to use a custom name for the event, select the Use custom name check box. Enter a name for your event. If you have not associated unit content with the event, enter a name for your event. To add date and time details to your unit event, in the When area, click on the provided fields. If you have more than one group participating in the same unit event during different time intervals, you can create multiple instances of the same event, tailored to each group’s needs. The group events share the name and description fields, but once you finish creating the events in bulk, they display as individual events. In the Attendees area, click Add Groups/Sections. This option is only available if you have already created at least one group or section for your unit. In the Add Groups dialog, click on the group or section you want to add. Repeat steps 3-4 until you have added all of the groups you want. Enter the rest of your event details, including any customisations for an individual group or section. From the tool navigation, click List. Select the check boxes by any event for which you want to make visibility changes. From the More Actions button, click Change Event Visibility. From the Event Visibility drop-down list, select your visibility preference. Select the check boxes by any event for which you want to offset dates. From the More Actions button, click Offset Dates.